Fun Loving Criminal Huey Morgan appeared to have lost his sense of fun when he had a tantrum on the set of Never Mind the Buzzcocks, violently smashed a mug and stormed off the popular BBC panel show. Those generally lacking a sense of humour or who are prone to taking themselves too seriously are ill advised to accept invitations onto the show, as good natured but incisive mockery are the order of the day. Sadly, Morgan appeared to be guilty on both counts. The Next Line round was where it all started to unravel. 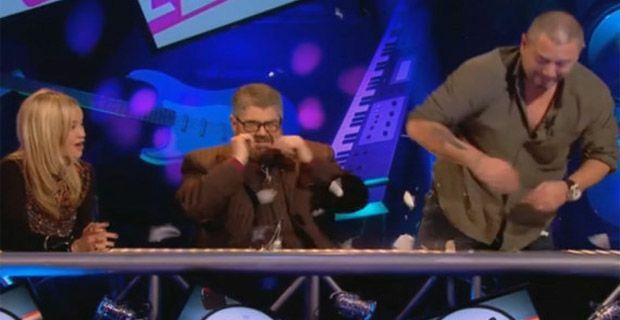 Generally a recipe for silliness, and often featuring lyrics from the guests on the show – perhaps in the hope that they will have forgotten them, it all proved a bit too much for Morgan. He was sat alongside team mates Laura Whitmore and captain Phil Jupitus when he started to come apart at the seams. He appeared to round on Jupitus after he corrected Morgan on his misquoted Tina Turner line before going on to struggle with M Beat feat General Levy’s Incredible. He did not seem to be bringing much of the joviality one expects from the programme. It was all downhill from there as Morgan hurled his mug onto the desk in front of him, shattering it and putting the other guests in danger of flying chips in the eye. He then exited the studio with his toys well and truly out of the pram as the other guests looked on in disbelief at such a ludicrous display of humourlessness.